ii) a longitudinal approach taking into account the dynamic of the deregulation of these functions to unravel the mechanisms underlying the loss of homeostasis and risky behaviours, in order to prevent and possibly correct them. Metabolic syndrome and obesity are associated with neuro-behavioural modifications in relation to food hedonism and motivation, such as hyperphagia, snacking, cravings and addictive-like behaviours (Val-Laillet et al. 2015). Food intake is tightly regulated at the central level by two central systems/loops working in interaction (Berthoud 2002, Berthoud & Morrison 2008): the homeostatic system/loop, including the medulla and hypothalamus, which are integrative centres for signals from various peripheral origins; and the reward system/loop (brain reward circuit), notably composed of dopaminergic corticostriatal areas that are particularly responsive to high-fat and high-sugar foods (palatable food). The brain receives, combines and integrates exteroceptive information coming from external senses as well as the interoceptive information coming from the digestive system. Although extremely accurate, these complex interactions between homeostatic, energy-driven and non-homeostatic reward-driven processes and integration of extero- and interoceptive signals are compromised and degraded in metabolic syndrome or addictive habits (Ziauddeen et al. 2015). Yet, the exact mechanisms as well as the predisposing factors resulting in these changes in the homeostatic / reward systems are not understood. The gut is the first organ in contact with the food. It is endowed with numerous functions enabling signaling to organs involved in metabolic homeostasis and behavior, such as the brain. These interoceptive signals continuously update the body of the internal state of the individual, especially its nutritional status. Recent evidences suggest that the gut-derived signaling involved in homeostatic regulation of food intake is impaired in animal models of diet-induced obesity (de Lartigue et al., 2012). Furthermore, the intestinal microbiota can both be modulated by food and modulate host physiology, metabolism and behavior through its composition or its metabolites, acting at local or more distant levels. Many scientific evidences support the idea that metabolic syndrome results partly from impairment of the communication between the microbiota, the gut and organs involved in behavioural and metabolic homeostasis. Microbiotal compounds or even bacteria crossing an altered intestinal epithelial barrier induce low-grade inflammation, altering the normal homeostatic regulating pathways. Entero-endocrine communication pathways are also altered in obesity (Duca et al., 2013). Recent data or hypothesis papers point on the possible role of gut microbiota in impinging of emotional processes (anxiety, depression, pleasure) which involve the same central reward systems than those regulating hedonic consummatory behaviour (Frost et al., 2014, Cryan and Dinan, 2012). Yet, this possible role of gut physiology, ecology and signaling in the hedonic regulation of food consumption is not yet established. Based on this context, we hypothesized that the altered regulation of food intake (homeostatic-hedonic balance) during chronic exposure to a deleterious nutritional environment is partly due to aberrant signaling from the gut and/or aberrant integration at the brain level. To test this hypothesis, our specific aims are: 1) to describe the exact nature and timing of neuro-behavioral alterations during chronic exposure to a deleterious nutritional environment and conversely, to investigate which neurobehavioral anomalies (or vulnerability factors) can favour detrimental eating habits in face of deleterious nutritional environment, 2) to investigate how and when a deleterious nutritional environment alters the intestinal functions involved in gut signaling (e.g. intestinal barrier function, entero-endocrine cells, enteric nervous system, intestinal immune cells) taking into account the potential role of gut microbiota and its metabolome and 3) to evaluate the downstream consequences on gut-brain dialog. 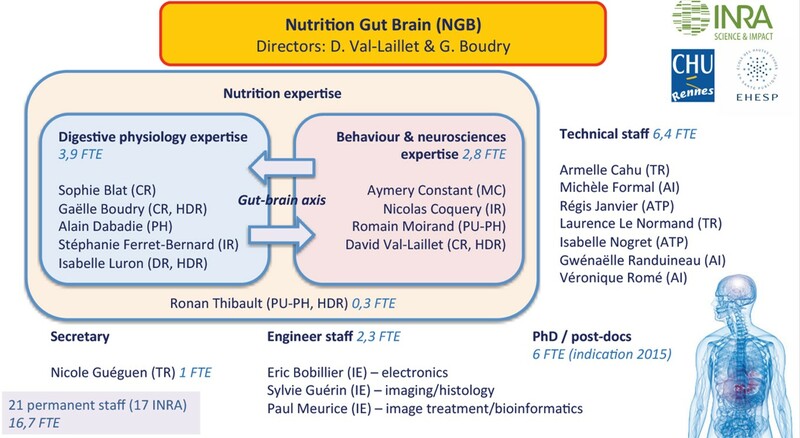 The team is composed of 7.0 FTE scientists with complementary scientific expertise: digestive physiology with people focusing preferentially on the intestine, pancreas, or immune system (and their relationships with the microbiota and its metabolites) and behavior and neurosciences (i.e., ethology, health psychology, addictology, neurobiology and brain imaging). In the first approach, we plan to use animal models (pig and rodent) to investigate the temporal dynamic of intestinal and neurobehavioral alterations during chronic exposure to a deleterious nutritional environment. Study of this temporal dynamic includes nutritional changes occurring at the adult age as well as perinatal conditions. The relations between the gut and the brain will be first evaluated on a temporal basis to establish sequential relationships. Causal relationships and mechanisms will be tested using cell culture or gain-loss of function approaches. We aim to validate our results in human cohorts using non- or minimally invasive approaches when possible. Beside temporal relationships, this longitudinal approach will enable us to propose prevention strategies adjusted in terms of timing and target that could be initiated before the onset of pathological conditions in the general population and in at-risk subjects suffering from predisposing factors. The second approach is clinical. Cohorts of patients hospitalized for different pathologies related to problematic eating habits (overweight, obesity, eating disorders, alcoholism) will be established to gather multifactorial data (e.g. via food questionnaires, psychological assessments, biological samples, functional brain imaging, etc.) and design relevant and efficient interventions for the target populations. The long-term goal is to use the same indicators than those discovered in the first strategy to predict the evolution of individual trajectories and orient the therapeutic approach (with the long-term goal of individualized medicine), and confirm the efficacy of intervention. 2- Impact of microbiota colonization on gut-brain development in infancy and long-term consequences on gut and metabolic homeostasis in adult with diet-induced obesity and metabolic syndrome. 3- Health promotion and reduction of the damages related to problematic consumption of alcohol in overweight/obese patients.